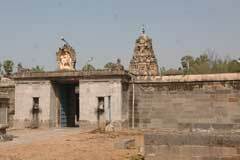 The temple is praised in the hymns of saint Tirugnana Sambandar. 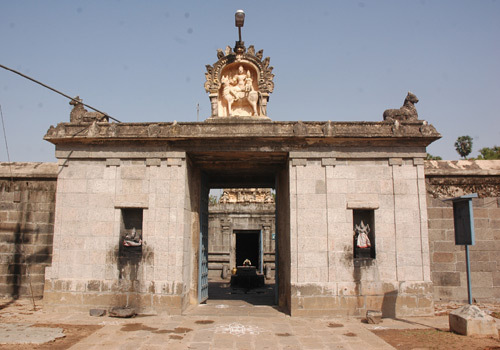 This is the 16th Shiva Temple of Nadunadu region praised in Thevaram hymns. Wedding festival is celebrated on the Tamil New Year day falling almost on April 14 or a day before or after occasionally in some years, Vaikasi Visakam in May-June, Shivrathri in February March, Tirukarthikai in November-December, Skanda Sashti in October-November and Thai Poosam in January-February are the festivals celebrated in the temple. Wedding festival is celebrated on the Tamil New Year day falling almost on April 14 or a day before or after occasionally in some years, Vaikasi Visakam in May-June, Shivrathri in February March, Tirukarthikai in November-December, Skanda Sashti in October-November and Thai Poosam in January-February are the festivals celebrated in the temple. 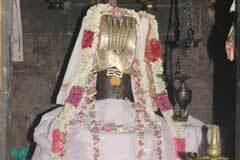 Lord Vadukeeswara is a swayambu Linga slightly leaning on the left side. There are scars on the Linga. As a respect to Lord, a turban is tied on the head. 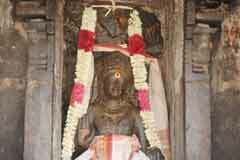 The temple is open from 6.00 a.m. to 11.00 p.m. and from 5.00 p.m. to 8 p.m.
Sri Vadukeeswarar Temple, Via Kandamangalam, Tiruvandar Koil Post, Puducherry – 605 102. 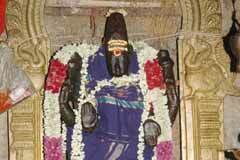 Special abisheks are performed to Lord Vadugeeswarar and Lord Bhairava on Ashtami days for removal evil effects. 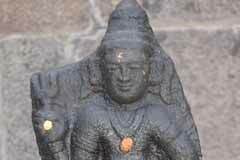 Those facing problems in wedding matters and suffering from illnesses perform abishek to Lord Bhairava with honey and sugarcane juice and feed the dogs. Lord Muruga on his peacock vehicle turning left graces with His six faces, 12 hands and weapons. Saint Arunagiriar in his Tirupugazh hymns ensures that the devotee would be relieved of all his/her sins if they worship Muruga in this form. Mother Durga graces from wall around the sanctum with Her hands ready for a war. 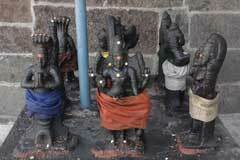 Devotees pray here for success in their efforts. 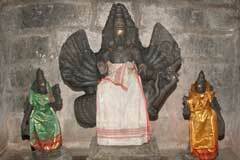 Lord Arthanareeswara is on Her left and Lord Pradosha Nayanar on the left. 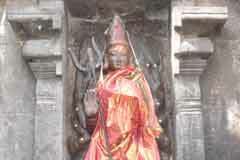 Lord Vinayaka is praised as Valampuri Vinayaka. 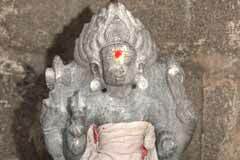 Tiruvandarkoil is 20 km from Pondicherry on the Villupuram road. Bus facilities are available.